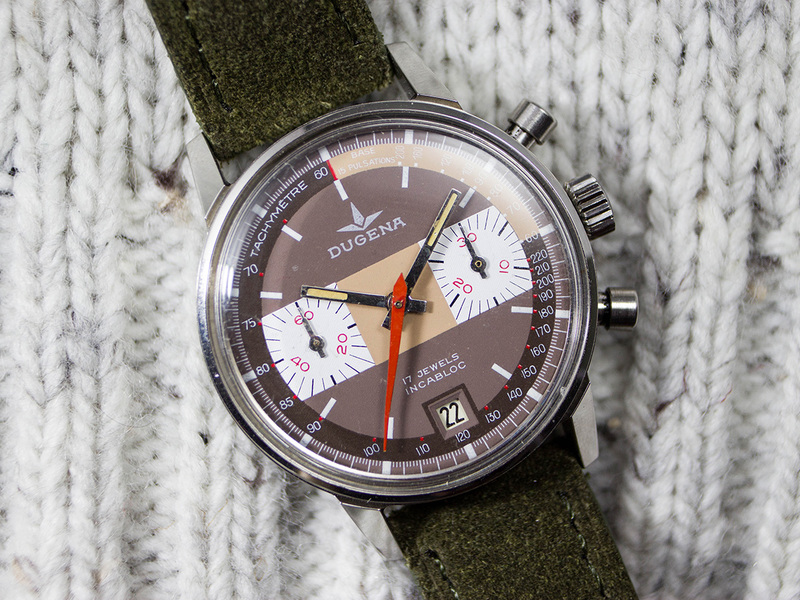 The name “Dugena” is one of Germany’s most famous watch brands. The roots of the company lie in Switzerland, namely with the Swiss watchmaker association Corporation d’Horlogers Suisse, which was founded in 1883 by Gottlieb Hauser. This was called Union Horlogère from 1901 and presented itself at this time with the brand name Alpina, which was first used as the name of a proprietary caliber. From about 1909, there is a branch in Glashütte, which bears the name “Präcisions-Uhrenfabrik Alpina”1917 the Deutsche Uhrmachergenossenschaft Alpina (German watchmaker cooperative Alpina) is created by the concentration of the watch factories Biel-Geneva and Glashütte in Eisenach. 1927 their headquarters is moved to Berlin. During World War II, the Allies prohibit the Union Horlogère to continue to market in Germany under the name “Alpina”. Therefore, 1942 in Berlin it is decided to rename Alpina into “DUGENA – Deutsche Uhrmacher-Genossenschaft Alpina” (German watchmaking cooperative Alpina). As a unique trademark the circle in the triangle is chosen, under which the new brand achieves a high level of awareness. This watch sized at 36mm is perfect both for him or her. The dial is in inmaculate condition, featuring a 2-scale outside ring with a pulsometer (base 15 seconds) and a tachymeter. The red hand really pops on this one, making it sporty yet classy. It also features the date at 6 o’clock, making this watch a perfect “desk-diver”! If we take a look inside the case, we see a Valjoux 7734 that has been serviced and cleaned. Pairing it with a green suede leather strap, it makes the watch even better. So grab it today before it’s long gone, in this condition it’s hard to find! PRICE = WAS 1000€, NOW 800€ NET TO ME (LAST PRICE) SHIPPED WORLDWIDE. Watch is located in the EU.